The shale industry, oil and gas, is reviving rural America and can only be described as a true economic godsend to places such as Montana and North Dakota. One of the most exciting things to take place in this country over the last few years has been the resurgence in American oil from American soil via the shale industry. The conversation about energy has changed from one about scarcity to one of abundance. Along with the tremendous uptick in drilling and production, has come the demand for thousands of jobs. The demand for workers couldn’t have come at a more opportune time either, as much of the country saw unemployment numbers skyrocket during the recent economic recession of 2008. Today, energy producing states like North Dakota and Texas are experiencing the lowest unemployment numbers in the United States, and still have openings for job seekers. 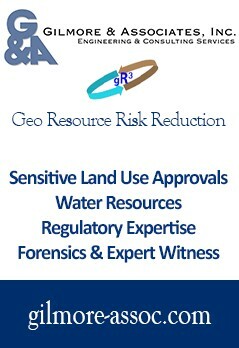 This poses huge opportunities for not only oil prolific areas, but for neighboring states as well. Montana is a prime example of a state that’s seen an economic boom in light of a nearby oil boom. Not all who’ve entered the oilfield had previous experience working in oil and gas. In fact, many have gone to work in the oil patch and the shale industry due to declining wages or work shortages in other industries. 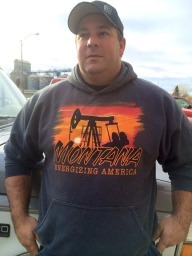 Take Kurt Kukowski, for example, now with Northern Oilfield Services in Plentywood, MT. Originally from Minnesota, Kurt taught and coached for 11 years in Wisconsin before deciding that he would move to Plentywood to take a job in the Bakken, so that he could provide more for his family. That was two years ago. Now, Kurt’s wife Becky and their two children, Henry (6) and Vera (3), have also made Montana home. Becky teaches and coaches in the Plentywood school system. 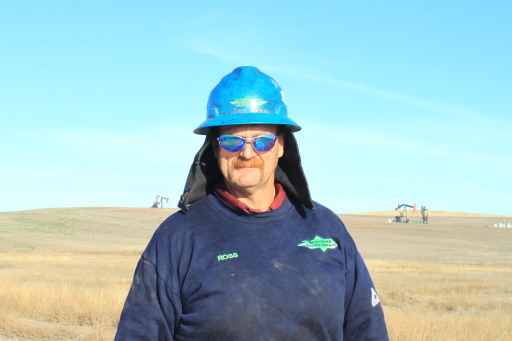 Kurt is a lease operator, also known as a pumper, and has one of the more routine positions in the oilfield. He gauges tanks daily for fluid levels, recording the numbers first, then calling them into the office by two-way radio. Pumpers also ensure the units and fluid lines are working properly, and act as the eyes and ears on the ground. “Towels, a wrench, and a tank gauge are the most important tools for a pumper,” Kurt said, who is meticulous about keeping locations clean. Many pumpers start out as roustabouts, giving them the opportunity to troubleshoot and problem solve by gaining on-the-job experience of how everything works and is built on a well location. This makes it easier to identify any irregularities on regular pumping routes. The life span of a well can be as long as 40 years. Kurt checks 24 wells a day (between Montana and North Dakota) and is one of eight pumpers at Northern. Brandon Cunningham (pictured above) is another pumper at Northern, and has a B.S. in Computer Science, though he was working as a journeyman butcher in Washington before moving to Montana. He says that when the recession hit, union members with fewer years were hit especially hard, and he was barely getting by. He’d heard that many were finding high-paying jobs in the Bakken Shale industry, and left Washington to find out for himself. Though it took time for Brandon to find housing, he now makes a comfortable living, and is even able to send money home to relatives. Like Brandon, many arrive in the oilfield with post-secondary degrees they simply cannot put to work. One such short service employee at Northern, Dustin, has four associate degrees which he says he couldn’t use in northern California, where he moved from just a few months ago. 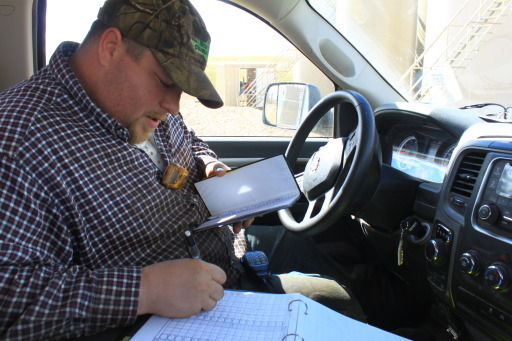 Some oilfield workers bring experience from other natural resource industries, like Joe Klessig. Joe moved out to Montana, also from Wisconsin, with a background in logging. He brought with him a Commercial Driver’s License and experience driving heavy equipment, including logging trucks, which has proven valuable in his position with Northern Oilfield Services. Joe (pictured left) and his wife Lauren (both in their twenties) live in Plentywood, and Lauren works locally as a caregiver. The faces of Northern, a small company which has been operating for 22 years in the Williston Basin from Plentywood, show the diversity of those who’ve sought out opportunity that prosperous and developing industries like oil and gas have attracted. What’s more, is that the shale industry is an equal opportunity employer, affording people from all walks of life a stable income, and the means to be a part of something that is contributing to America’s energy security and economic stability. 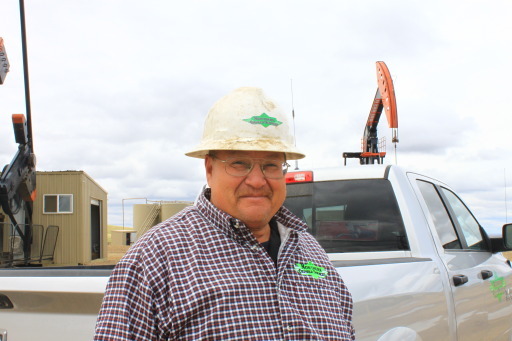 Among the ranks at the small-town oilfield service company are just over 30 employees, including Ross Marsh, Roustabout Foreman and Plentywood local (pictured below). Roustabouts build tank batteries. They set the tanks, build catwalks, and put the plumbing in place. Here, too, is Roustabout crew leader, Austin Linder from Plentywood, who works with new employees known as short service employees, or SSE’s, identified with green hardhats. Roustabouts are also called upon for many of the maintenance and repairs needed at well locations after production has started, which might include anything from a downed AJAX or Arrow engine, to a problem with the polishing rod on a pumping unit. 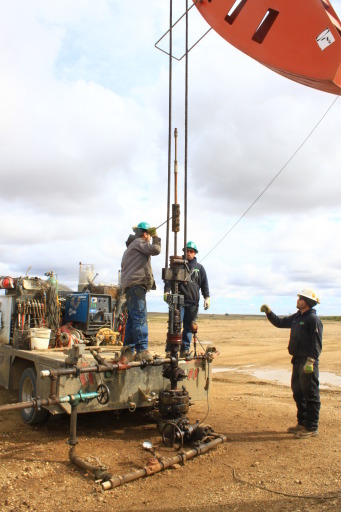 No two days are the same in the oil patch, especially for the roustabouts of the field. Ross has been in the industry since the eighties, and has a background in agriculture. He continues to farm to this day, though now leases much of the acreage he and his wife own. Marsh is also a former bull rider, and a real roughstock rider-tough kind of guy. Then, there’s JR Maldonado, the 27 year old Truck Foreman (pictured below) who is grateful for the oil development in the Bakken Shale. “This industry is a godsend,” Maldonado says. JR grew up just down the road from Plentywood in the town of Scobey, and graduated from the country’s smallest school (now closed) in Peerless, Montana with a brother and three other students. JR grew up as one of five children in a family that struggled to get by on only one income of $20,000 a year. “We ate spaghetti almost every night,” said JR, who doesn’t think much of the meal now. After graduating from high school, he took to the road where he hitchhiked for more than a year, traveling to all but four of the United States. During this time, Maldonado says he never pan-handled, but instead, worked odd jobs to make what he needed to eat and move on, describing a night he slept in the cold beneath a bridge. But it wasn’t all bad. 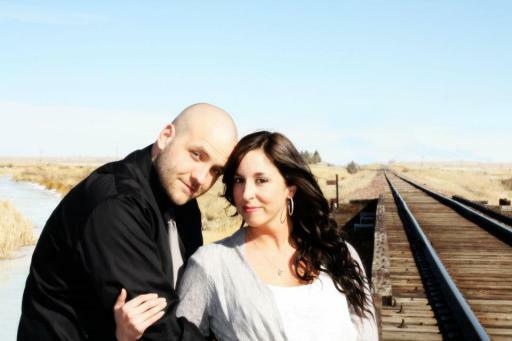 JR gained invaluable work and life experience on the road, and was hired to do heli surveying before meeting the love of his life, Lyndsey, in Pennsylvania. The two were married in JR’s hometown, and will welcome their second daughter next month. They now own two houses, and host free outdoor movie nights for the community. Matt Prince, a 4th generation Montanan from Plentywood, comes from a long line of Air Force servicemen and oilfield truck drivers like himself. Prince (pictured to the right) is married with three daughters and a son, and like JR, praises the oilfield for the opportunities it’s long provided him and his family. Prince represents just one of many other Northern employees who are generational oilfield workers, following in the steps of family members before them. Truman Hackmann from Flaxville, Montana is the Director of Field Operations and Consulting, and has been in the industry for decades. He adds a wealth of knowledge and experience to a company with many crew members in their twenties. 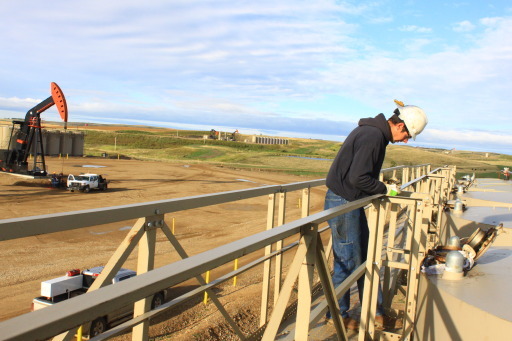 In addition to supervising field activities, Truman provides well site supervision and oilfield consulting to business partners Northern works with. Hackmann (pictured above) was with the company before the current owner, Bart Horner, bought Northern six years ago after a career in management with Yellow Transportation, and has since moved up within the company. Since Horner took over at Northern, the company has expanded significantly, adding trucking services for heavy hauling, and building a large new shop outside of town. Roustabout services and contract pumping still remain a large part of the company’s operations. In addition to the shop, Northern also has a main street location which Horner describes as a part of his vision for the company to be an active member within the community. The company has donated to countless local causes and organizations, including the Montana High School Rodeo Association. For years, Bart was a Director and later President in the rodeo association when son Caleb competed in team roping, calf roping and steer wrestling. Like Truman, Plentywood local, Jill Tommerup (pictured below with Bart’s trusty sidekick, Goose) was also with Northern before the ownership change. Since Bart took over, Jill explains, her responsibilities have increased greatly, along with the size and activity of the company. The uptick in drilling in the Williston Basin has provided huge opportunities for small companies like Northern, says Jill, who is now the Director of Finance and Strategic Management. Jill says her position has afforded her the right amount of flexibility too, including the ability to bring her three young children into the office if and when she needs to. 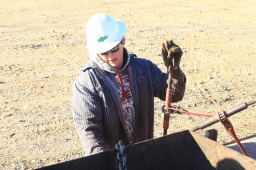 Jill touts the company’s uniqueness, saying that the local, non-rotational employees set Northern apart from other oilfield companies. 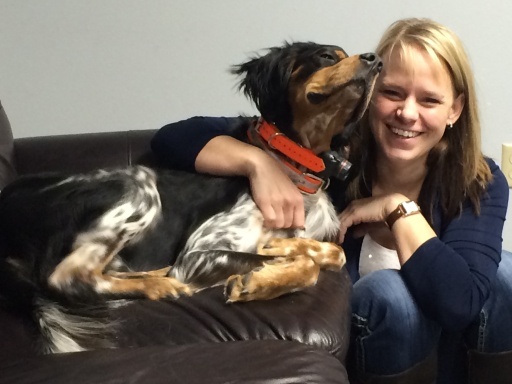 Jill described Bart as a very active owner, committed to providing competitive wages and benefits to employees, and inspiring loyalty within the company. Bart often quotes J.P. Owen’s Code of The West at company meetings, citing the Ten Principles to Live By, like “Ride for the Brand,” and “Take pride in your work.” Horner keeps a framed copy of the principles in his office. The sense of pride at Northern Oilfield Services couldn’t be more apparent, not only in the company, but in the oil industry as a whole. And, the stories of opportunity and prosperity aren’t unique to Northern Oilfield Services, but are ubiquitous in the oil patch, Bakken Shale industry and beyond. Each and every employee has a story to tell, and they couldn’t be more indicative of everything which makes the resurgence in American oil production exceptional. This is what the American Dream looks like in rural America today, thanks to the shale industry! This is a well written piece – you want to know more about these people. I felt the same way and that’s exactly why I ran it. If only this could be the case in the People’s Republic of NY!